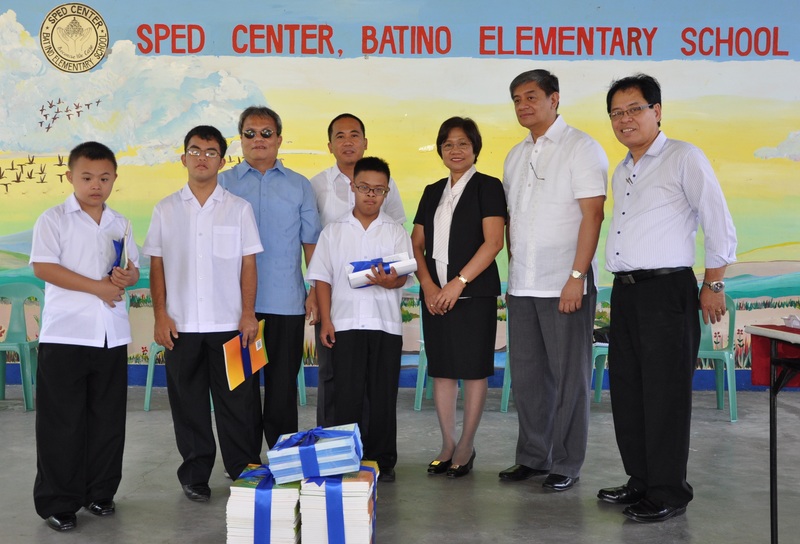 The National Council on Disability Affairs (NCDA) recently turned-over instructional and information materials to students with disabilities of Batino Elementary School in Quezon City, as part of its continuing campaign to promote the right to education of persons with disabilities as embodied in the UN Convention on the Rights of Persons with Disabilities. Undersecretary Alicia R. Bala (3rd from right) of the Department of Social Welfare and Development who used to be the Officer-in-Charge and currently Alternate Chairperson of the NCDA Governing Board, spearheaded the National Campaign to Promote White Cane project among blind persons especially those studying in the elementary level which subsequently resulted to inclusion of instructional materials for other children with disabilities. Joining her are (from right to left) NCDA Chief Information Officer Rizalio R. Sanchez, Department of Education Undersecretary Albert T. Muyot, Batino Elementary School Principal, Mr. July Villapa, and NCDA Deputy Executive Director Mateo A. Lee, Jr., including students with disabilities from said school.